T888 Mac launcher(?) is broken. T1308 Moonlight Flame Helmet's flame position can be offset based on your pony's head position. T1298 School of Gifted Unicorns has a name cut off. T1294 Bramble Woods hole can lead to out of bounds. mathman22 created T2612: Traveling to Ponydale. Skeetle_Lambert created T2611: Dandelion tamer quest marker bug. Citrus created T2610: I Shouldn't Be Here still stuck after fix - quest item unobtainable and undeliverable. KillerMemz created T2609: Reuse of ability icons causing confusion, and tooltips show up too slowly to know what I'm using on the fly..
ProudyHooves added a comment to T2519: Can't see my own equipped scarf/Can see other people's scarfs. Checked my character, apparently this manestyle can cause scarf glitch, any plans on fixing? Nebenfigur added a comment to T2608: My Unicorn has no teleportation spell. You should find it in Talents(red) -> Other(green) -> Teleport(blue). Drag and drop into the skill-bar. Are you missing Other or Teleport? Or doesn't something else work? kaciekk created T2608: My Unicorn has no teleportation spell. chocolate.weaner added a comment to T2578: A bug relating to quest named mindless violins and it belongs in a museum. I'm not sure. I may have deleted the item because I can't find it in my inventory. EvilRedEye created T2607: Can't Log In. Cloverhoof added a comment to T2545: Reefus indicator refuses to go away. Sorry for necromancy or "reopening" (if you will) this particular thread, but I feel it's worth nipp. Rattletrap added a comment to T2503: Disappearance of Mobs and Players. Were you wearing any specific accessories when it happened? CelestialHarmony added a comment to T2578: A bug relating to quest named mindless violins and it belongs in a museum. from Mindless Violins quest when you talk to pyrite and when you got to him after you done Mindless Violins. Where do I get the statue? Static added a comment to T1656: ( Closed ). Hey Rattle, I'm now on my Mac, but there is no way for me to close it like you described. I cannot edit the task beyond the title and the description, everything else regarding edit options are grey and cannot be selected. Static updated the task description for T1656: ( Closed ). NightBlitz added a comment to T2604: Constantly kicked from server . 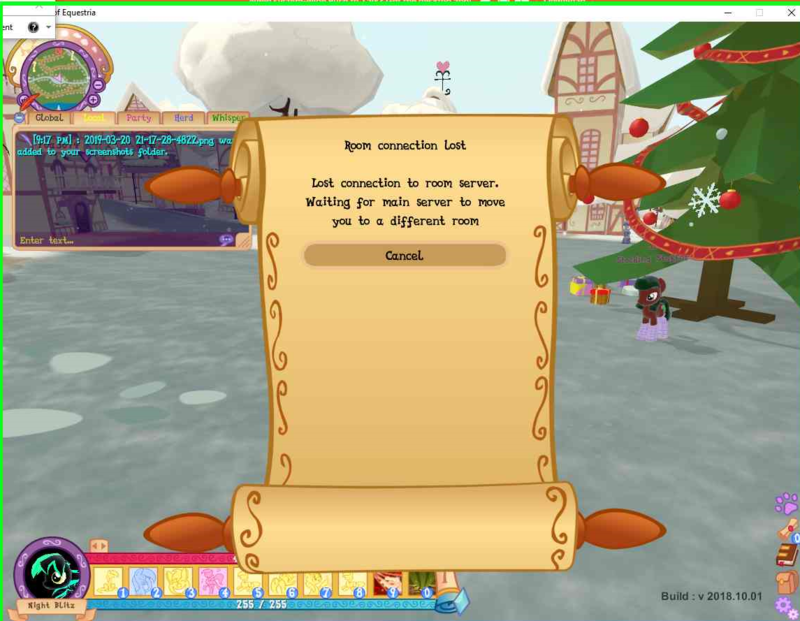 CelestialHarmony added a comment to T2475: Game crashes after 28 room/map changes. crystal5555 added a comment to T2502: Not graduating, quests at graduation ceremony. 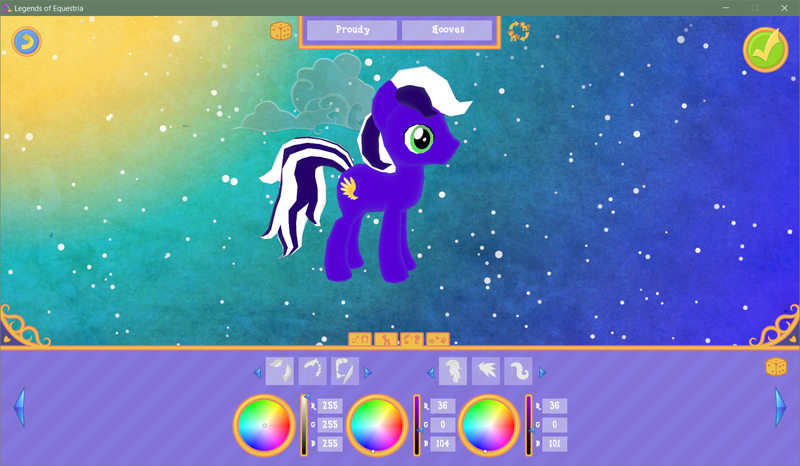 Something to add on, I've recreated the earth pony shortly after with the animal talent and the result was the same. It took me a few attempts to get to a point where the ponies at graduation would separate throughout Equestria. What I seem to notice was that if you don't use Guidance while doing the animal talent quest, the result is the same as described here. If you do, everything works out. crystal5555 added a comment to T2503: Disappearance of Mobs and Players. As far as I've known, no. Then again, it seems like a rare occurrence. I have not tried reproducing it recently. Lens_Flare added a comment to T2475: Game crashes after 28 room/map changes. IceCream added a comment to T2475: Game crashes after 28 room/map changes. I think I had this issue happen twice to me a few weeks ago, and a few more times before then, I was wondering why my game always crashed after I did many room/map changes - I thought it was only my computer. IceCream created T2606: "The Letter of the Law vs. the Spirit of the Law" Quest Marker Bug. IceCream created T2605: "Removing Cookies and Browsing Data" Quest Marker Bug. IceCream added a comment to T2294: Pet System Bug. I have an earth pony unicorn and pegasus, but my pegasus is the one that can’t get a pet. 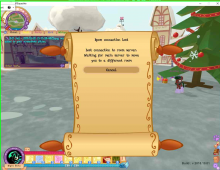 I’ve completed the quests “Dust and Bunnies”, "Mindless Violins", and "Intensive Carrot Unit", but I didn’t get any pet eggs in my inventory (I don't think my inventory was full either when I completed them). Rattletrap added a comment to T2519: Can't see my own equipped scarf/Can see other people's scarfs. There is a bug involving certain mane styles that does not allow the scarf to be seen when worn. Rattletrap merged task T2512: Clicking on hotkeys during dialogue without pressing anything into T2513: Hey wait remember that thing I mentioned earlier? About slots being used during dialogue?. Rattletrap merged T2512: Clicking on hotkeys during dialogue without pressing anything into T2513: Hey wait remember that thing I mentioned earlier? About slots being used during dialogue?. Rattletrap added a comment to T2512: Clicking on hotkeys during dialogue without pressing anything. However, do you have a separate numkeypad on your keyboard? If you have numlock engaged, that might possibly be causing the issue. Rattletrap added a comment to T2506: Unable to sign in. Did you verify that the forum account works? Have you tried looging in to the forum itself? If you cannot log in to the forum, then you likely have not completed the account verification steps. Has this problem occurrred in the v2018.10.01 build? Rattletrap added a comment to T2502: Not graduating, quests at graduation ceremony. Did you actually finish the Combat quest and get the final skills and grow up? Rattletrap closed T2500: bugs as Resolved. Looks like you had a bad download and the render failed on the fog particles. Glad that you got it fixed. Closing this up now. Rattletrap added a comment to T2499: Game Settings. Rattletrap closed T2498: Stuck in a wall as Resolved. Rattletrap closed T2497: Stuck between realms (Ponydale schoolhouse) as Resolved. Rattletrap added a comment to T2492: game crash folder 2018-10-03_010854. Has this error recurred since the first time? M4R10 added a comment to T2477: [Linux] LoE doesn't launch. Is this issue still occurring in v2018.10.01? Rattletrap closed T2489: lv 50 golems not giving exp or loot most of the time as Resolved. The lvl50 golems do not always drop loot.